Truro Vineyards has always been my favorite New England vineyard. I've gone on their free tour and enjoyed their wine tastings so many times. It's been a couple of years since I stopped by, so yesterday my fiancee and I went to see what's new. Truro Vineyards is making more than wine now. They've launched South Hollow Spirits, making rum in a 250 gallon copper pot right on the Truro Vineyards property. Visitors can tour South Hollow Spirits to see how the rum is made. 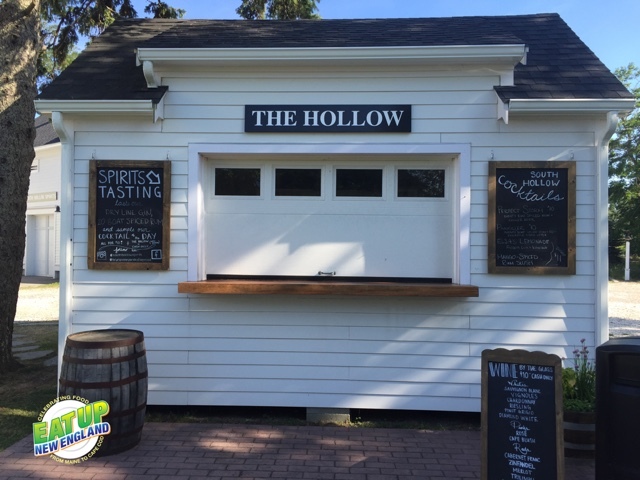 They are also selling refreshing mixed drinks and their wines in the little building above called "The Hollow." One of the drinks when we were there was "Elsa's Lemonade," a mix of frozen gin and lemonade. How good would that be on a hot Cape Cod Day? I'm a massive fan of their Cranberry Red wine, so that's what I enjoyed. Customers can sip on their win or cocktail right on the Vineyards' sunny front lawn. They also have a food truck on site from Blackfish restaurant that serves up lobster rolls, rice bowls and burgers.